The 700 foot long Garden Pier in Atlantic City was built in 1913 at the end of New Jersey Avenue. It had formal gardens at it's entrance that connected to an open air theater. At the ocean end there was a four story building that served as a ballroom, exhibition center and indoor theater. The ocean end of Garden Pier was destroyed by a hurricane in 1944. The part of the pier near, and on, the beach was restored and the pier now houses an Art Center and Historical Museum. Garden Pier has been refurbished and now houses an Art Center and the Atlantic City Historical Museum. Within the museum are a Mr. Peanut, a vintage boardwalk rolling chair, and many other items from Atlantic City's nostalgic bygone days. Garden Pier was damaged by the hurricane of 1944. As of 2010 the pilings from the damaged section were still there. During 2011 these pilings were removed and 6,000 cubic yards of concrete from the pier were moved, and sunk at the nearby Great Egg Harbor Artificial Reef. The Art Center and Historical Museum have been refurbished and upgraded. Below is a photo of Garden Pier after the old pilings were removed. In 2011 the damaged section of the pier was removed. The refurbished Garden Pier as seen from Revel's Sky Garden. Steel Pier is in the background. The Garden Pier hosted theatrical events, expositions, and even conventions.The first Golden Mermaid beauty contest, that was the forerunner of the Miss America Pageant took place at Garden Pier. It's ballroom became a very pooular dance palace. Rudolph Valentino began his career as a dance instructor at the Garden Pier Ballroom. Walt Whitman and the John Phillip Sousa band often played there. Garden Pier - Another View - 1921. Post Card by Virginia Post Card Co. - From the collection of Thomas Topham. For twenty-two years the largest typewriter in the world, 1,728 times normal size, was on exhibit at Garden Pier. The typewriter was originally built by the Underwood Corporation for the 1915 Panama-Pacific Exposition at San Francisco. It had a ribbon 100feet long and a bell you could hear from a long distance. The premature baby incubator exhibit was housed at Garden pier. Garden Pier Dancers - 1920ish. 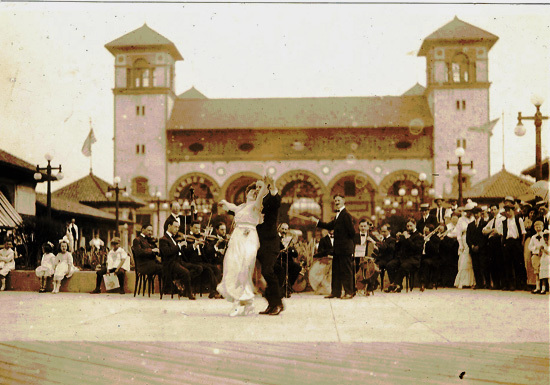 On the back of the photo: Snaped while dancing for moving pictures in front of Garden Pier.